Sotomayer was photographed, with Marc Anthony and Jennifer Lopez, at the Congressional Hispanic Caucus Institute 32nd Annual Awards Gala that took place in Washington, D.C. I had the honor to meet Justice Sotomayor, earlier in the day in her chambers, at the US Supreme Court Building for a magazine photo shoot. Latina Magazine and Platon were in town to shoot the cover for the magazine’s December/January issue featuring Justice Sotomayor. What no one realized was that this photo session would produce an extraordinary experience of human connection through the intimate setting of portrait photography. Photographer and subject were joined in instant friendship that spilled out to those of us working that day and observing the moment. 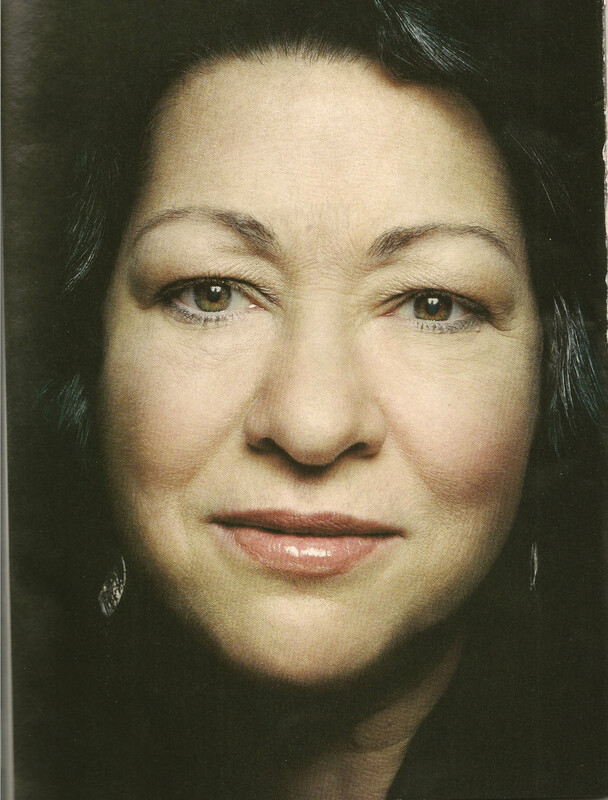 Keep a lookout for Platon’s new book, which may include more details about Sotomayor. Taking place in the US Supreme Court Building in Washington, DC, the crew got a tour of the 1930’s building after the photo shoot. Most striking was the court room itself, which one enters from a vast vestibule of monolythic (solid) marble columns revealed only by a doorway at the end. Once inside, there are friezes carved in stone of integral figures depicting the history of law, high above along the walls of the ceiling that seem to reach to a heavenly gate of justice. As we gaped in awe around the courtroom, we each took turns standing at the worn lectern (supposedly containing nail marks and sweat from previous lawyers), pretending to plead our case to the 9 very close, thankfully empty, custom made, leather swivel chairs. The Library, which is exclusively used by a privileged few was a peaceful and solemn place protected by volumes of bound historical court cases. There was a certain comfort, in those rows of shelves containing hard leather books and pages, that made me feel grounded and secure. Maybe I was having a flashback, to the 30 years that my mother worked in the University of Akron‘s Technology Library. Rather, the calmness could have been in appreciation of my brother’s many years of studying and practicing Law. Either way, knowledge and surrounding yourself with books is a comfort that everyone should indulge in often.